SoyUltra® Fuel Additive is a concentrated, multi-functional, ashless fuel additive specially formulated for use in all types of gasoline and ethanol blends used in new and old two-stroke and four-stroke gasoline powered vehicles. 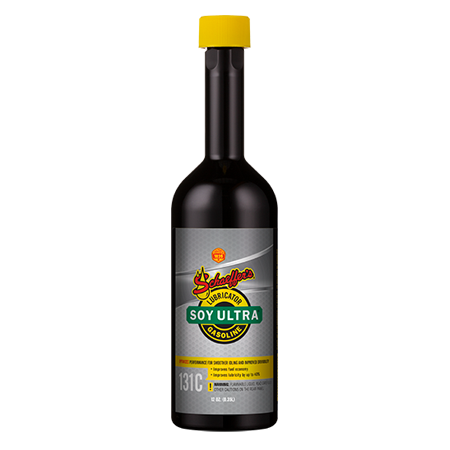 Made from soybean oil, SoyUltra® contains an additive package with friction modifying and detergency properties. This unique blend provides excellent wear protection for fuel injectors and fuel pumps – especially engines burning gasoline that’s low sulfur, reformulated, oxygenated or ethanol blend. Optimizes performance and fuel economy. Superb piston deposit control to reduce the risk of engine seizure.